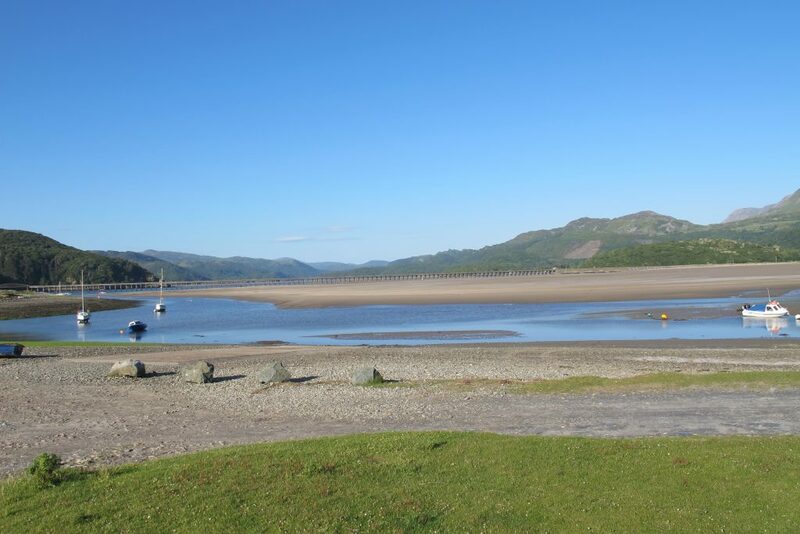 As we headed for our next stop – Fairbourne, just across the estuary from Barmouth – we had to pass through the lower slopes of the mountains of Snowdonia. Beautiful scenery, but all of that rock around means that instead of hedges the roadsides are mostly walled – slightly less forgiving if you need to pull in tight to let another vehicle pass. We had a few ‘breathe in Bertie’ moments but only one point where we met another motorhome and kissed wing mirrors, not too bad. 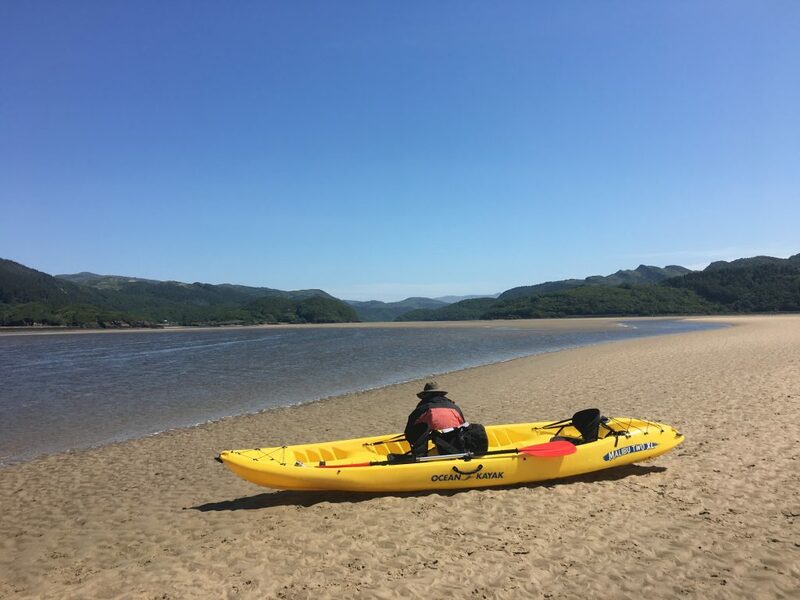 Fairbourne, like Borth, is a seaside village with long sandy beaches, dunes and a golf course, but the Mawddach estuary has a cycle trail and kayaking and that’s why we were there. The parking spot at Fairbourne has a no Motorhome sign up, which we were assured we could ignore so long as we weren’t the type of person who leaves litter behind and dumps their toilet waste on the side of the road (who would?). 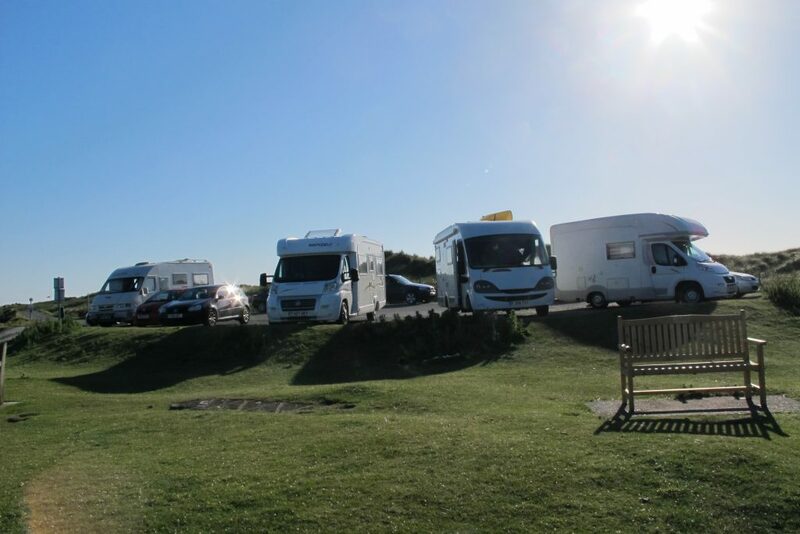 It was also the busiest motorhome parking spot we had stayed at. The weather had been very windy for the past couple of days – so much so that it was starting to drive us slightly nuts, one of many reasons why I could never be a lighthouse keeper. But we knew that the forecast was for the winds to drop and a spell of very warm weather to arrive. Plus the tides were ideal for kayaking with high tide in the early afternoon. The plan was to head up the estuary a couple of hours in advance of the high tide, stop at the pub in Penmaenpool and then turn around and head back down to Fairbourne on the outgoing tide. The estuary is very shallow with numerous sandbanks and dead end channels so trying to navigate at low tide is pretty difficult. We set off at 11:30 from our launch point, nice and close to our overnight parking spot so we didn’t have to carry the Kayak far, and navigated our way up the estuary. Behind us were three other paddlers – two Canadian style canoes and one sit-on-top kayak like ours. The paddle up was mostly easy – with only one Laurence of Arabia moment where we had to get out of the kayak and find our way across the dry and arid sandbar that seemed to stretch on forever in order to find the channel that we should have taken. We stopped for our pint at the George III inn before heading back. Route finding on the way back was easy, but fighting the strong breeze that was pushing us back up the estuary was a lot harder – we both had achy shoulders by the time we got back. We didn’t get round to cycling the estuary trail the next day because it became really hot, too hot to do much except for escaping to a campsite where we could put the awning out and escape from the sun.